The garden centre has designated disabled parking spaces by the main entrance with automatic doors for easy access. Inside there are wide spaces between displays and outside we have flat wide paths with no steps. We always have staff available to help customers to carry items and to load cars. 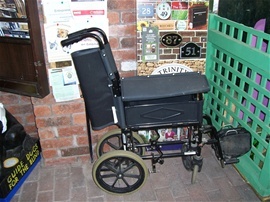 For added convenience wheelchairs are available inside the main entrance for the use of customers.